I love reading series of books. There’s nothing better than getting to the end of the book and knowing that there’s more to come; that these characters you have come to love don’t have to be given up just yet. Some of my favourite series include Harry Potter, The Hunger Games, the Millennium trilogy, and the ongoing A Song of Ice and Fire series. But for every series that I devour within days of starting, there are also loads that I start and never get around to finishing, and I thought I’d share some of them with you today. I read Angels and Demons and The Da Vinci Code along with everyone else, way back when they were first released in 2006. I know that they were never considered the most literary of novels, but they were entertaining and thrilling, and I really liked them. The films were dire, particularly the adaptation of The Da Vinci Code, which managed to be both boring and ludicrous all at the same time. When The Lost Key came out after a long wait, I was quite excited to read it, and I was so massively disappointed. I really didn’t like it at all, so when it came to the fourth in the series, Inferno, I just had, and have, no desire to read it. I don’t know if there are any other Robert Langdon novels in the pipeline, but I can’t imagine I’ll be bothering with them. I hate those people who try to say that they liked something first, but I was pretty quick off the mark with Divergent, at least amongst my friends. I loved it. I told everyone I knew about it, and was really annoyed that I’d have to wait for so long for the second in the series. Then, when Insurgent was finally published, I didn’t read it. My friend lent it to me, and I tried to read it, but I couldn’t remember the important plot points from Divergent. I still have Insurgent sitting on my bookshelf, unread, and the third book has long since been released. Now the film of Divergent is out, so I think I’ll go and see that, and then maybe I’ll finally be ready to read Insurgent and Allegiant. Reading a Jack Reacher book is like watching a ridiculously high budget action blockbuster. They are a bit rubbish, but they are so readable and addictive that when I first discovered them I read six books in this series in three months. And then, for some reason, I just stopped. I suspect I had just read too much in a short space of time, and like I said, the books aren’t brilliant, they are just ridiculously entertaining. I’m sure I’ll go back at some point and read some more, but there’s so many books to read and so little time! Another series that I started many years ago. I read the first two in this series, Eragon and Eldest, in really quick succession, and loved them. Way back then, they weren’t even my type of book particularly, but I really loved the world of Eragon and the mythology. It took quite a few years for the third book, Brisingr, to come along, and by that time, all the enthusiasm I had for the books had waned, I didn’t want to buy the book with any urgency. I still have the first two books on my bookshelf, and I often toy with the idea of rereading them and moving on to the next two, but I haven’t as yet. Maybe this year! Are there any series of books that you want to go back and finish? I really need to get back to reading Wire in the blood series by Val Mcdermid. Seem to be about 4 books since I last read! I also started with the Inheritance Cycle books. I really loved the first two books but for some reason I never read the other two books. Yeah, I don't really know why I stopped! Not sure I'll ever go back either! 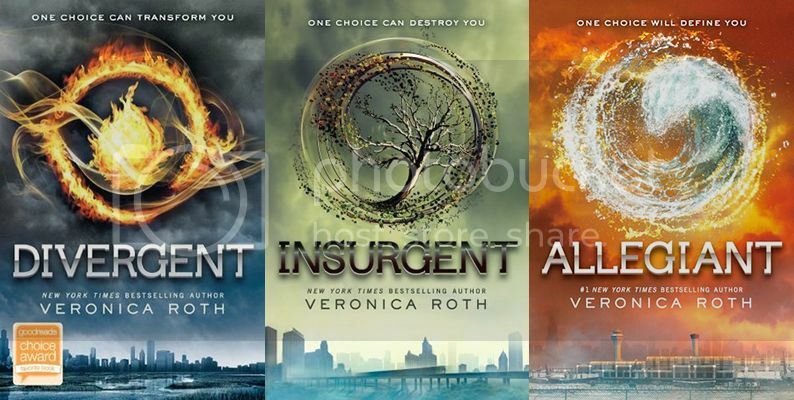 I really want to read Divergent, i shall have to check it out. I am currently reading Tomorrow When The War Began....great book and a series of 8! Wow, a series of 8! That's a commitment - I'll have to check it out!